Thanks for all the encouraging comments. A little more about the picture. - It was taken at ground level. - I had been watching the thunderhead build for a coupls of hours and took shots now and then. - This is looking East. - About an hour before sunset, I moved out to the side of the house and setup on the tripod. You can sometimes get dramatic effects at the end of the day with the sun lighing just the top of the clouds. - I would snap a shot now and then. These thunderheads change minute to minute. - I heard the ducks quacking as they left the little pond by the house. They hung a left and past right in front of the camera. I got two shots since I was already setup on the tripod. Great exposure on the cloud! Lovely tones and contrast with the silhouettes. I would probably have cropped a little differently, and left out the lagging duck. Did you take this shot from a glider or a balloon? It's really cool. One of my favourites this week. Good composition and the soft sepia tone is perfect. So is focus and the cropping. I don´t know how you could have done it better. Meets the challenge very well. Well done and good luck! Wonderful tones, marvelous ducks and lots of drama. I love it! Wonderful photo. I wish my entry was this good. Congratulations on a possible winner! 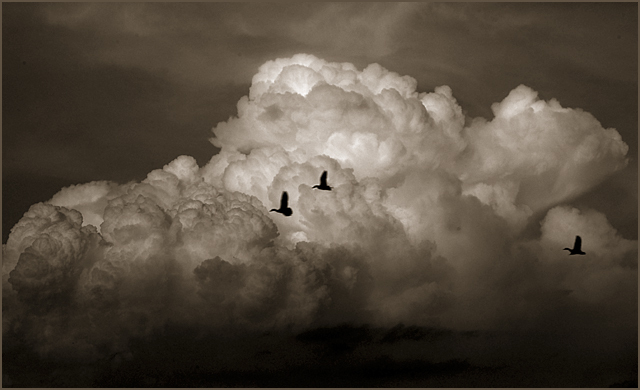 This is just a amzing photo, abit to dark but a 10 from me, it works well here because it gives the clouds a great stormy effect, and the birds, wow what a capture, very good work and exposer. At first glance I thought the ducks to be silhouetted by a cloud, but now believe it to be a plume from a smoke stack, no? Has a spooky or mythical feel about it, neat effect. Good job! wow! great tones in those clouds! just wish those ducks were sharp, looks like motion blur.... I would probably cropped out the last bird.... I like the image though.... good luck, Todd. Proudly hosted by Sargasso Networks. Current Server Time: 04/21/2019 02:13:45 AM EDT.